Fip Now Plays | Blog My Wiki! I’ve been tweaking my touch-screen Raspberry Pi radio. It’s optimised for the Pimoroni HyperPixel display, but it would work with any touch-screen, although it may need scaling for different sized screens. Aside from the mpd/mpc music player and adding some radio stations, it doesn’t need any other libraries installing and should run on vanilla Raspbian. You’ll need some GIF images of logos, the ones I used are on the page for the old version of this program. I’ve tidied up the display a bit, added a button to shut the system down and added a button that shows the track that is currently playing on Fip, my favourite radio station. This is actually rather useful as Fip’s music is famously eclectic and sometimes you just have to know what that achingly cool Belgian techno-influenced rockabilly-jazz tune is and who recorded it. to extract a UUID number that you then need to use to look up the track name. And sometimes the ‘performer’ field is missing for some reason, so I added an exception for that. But at least it’s there. Unlike BBC radio. And I learned a bit about handling JSON in Python. I made a really cool Raspberry Pi radio a few years ago that you controlled from a web page that had ‘now playing’ info for Fip (culled from a twitter account) and from the BBC via Last.fm. It looks like the Last.fm kludge doesn’t work any more, and the BBC seems to have closed the ‘Backstage’ operation which provided API access to its ‘now playing’ data for independent websites like https://dyl.anjon.es/onradio/1 – which, oddly, still seems to work. I could screen-scrape that web page, I suppose, but it seems a bit unfair on Mr Jones. It is very frustrating the BBC doesn’t seem to do this any more – if anyone knows different I’d be grateful. Fip doesn’t even require an API key. Anyway, here’s the Python program. It only fetches the Fip JSON data when you press the ‘fip now plays’ button so it doesn’t update all the time, and also does not bombard Fip’s servers with data requests. This entry was posted in radio, Raspberry Pi and tagged Fip, HyperPixel, Pimoroni, Python, radio, RaspberryPi. Bookmark the permalink. I see that FIP has an open API ( https://developers.radiofrance.fr/ ) and is doing regular hackathons. FIP fan here. Interesting re the “now playing” data you extracted from the FIP stream. I use various iOS and Mac apps to stream web radio, and some stations will easily show the song info in the app, like Classic FM http://media-ice.musicradio.com/ClassicFMMP3.m3u and Radio Paradise http://radioparadise.com/m3u/mp3-128.m3u , and some won’t, like the BBC stations as you mention. Although this BBC page claims that they do send the song name data for R1, R2, R3 and R6… https://www.bbc.co.uk/sounds/help/mobile/chrome/track_now_playing …unfortunately it does not show in any app I’ve used. Would be good if it did. 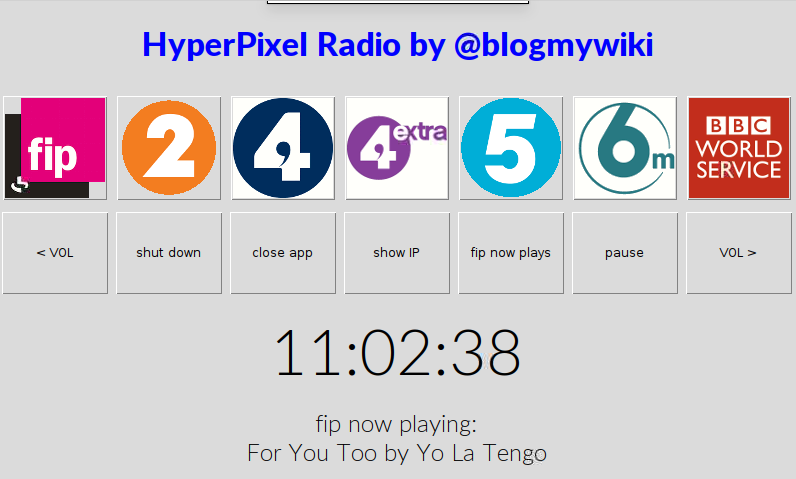 I’m particularly keen to see the song names for FIP – I’m not a programmer though, I’m only using web radio streaming apps. I can only use radio streams as they come, so either they have the song name info or they don’t. The FIP stream http://direct.fipradio.fr/live/fip-midfi.mp3 doesn’t give me song names, yet you’re able to extract them as you detail above. For me the song name needs to be sent in the stream in the more conventional way, if this makes sense, as Radio Paradise etc do. I’ve just sent an email (in french) to FIP / Radio France asking about this. I’ll see what they say. Who knows, they might update their systems.